When New Orleans is in the midst of The Eat Local Challenge and at a seasonal juncture when a few of Louisiana’s star culinary ingredients are available, “Spring Joy” salad is a summer must-make. 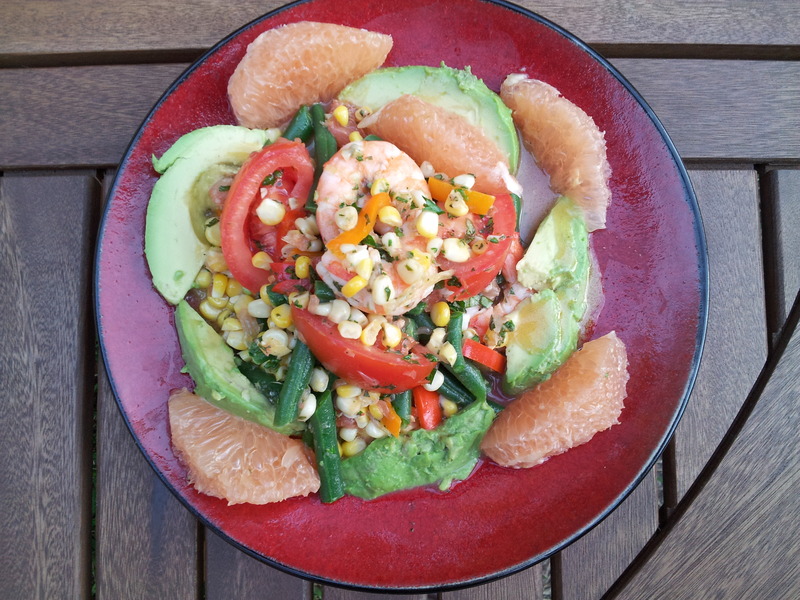 Though the composed salad has several components that require separate preparation, it is more manageable to make than it may seem, as the grapefruit and shrimp can be prepared and marinated ahead of time. – Place first six ingredients in a pan, cover with cold water, cover and bring to a boil. – With a serrated knife, cut top and bottom of grapefruit. Place the fruit on a cutting board and remove skin and pith by running the blade along the flesh of the fruit. Cut out segments, running the blade along each separation and lifting each segment. Reserve segments; refrigerate. – Squeeze peel and left over of grapefruit after it is segmented and mix juices with shrimp. – Arrange grapefruit and avocado segments around the perimeter of each plate. Mound the rest of the salad components in the center of the plate and drizzle with dressing. Jean-Mark Sens grew up in France and Belgium and has been living in the Southern United States of America for the past 25 years, except for a short stint in the deep East of Maine, which brought him back to New Orleans. He has taught culinary arts at the Chef John Folse Culinary Institute, Eastern Maine Community College and for Mississippi University for Women on the Gulf Coast. He has published a collection of poetry, Appetite, with Red Hen Press, and is now working on Leaves of Greens: Mostly Leafy Salads, a book on the arts and technique of composing salads.